WASHINGTON — Scientists in Spain have found the fossilized ruins of one of the largest animals ever to walk the earth, a gargantuan plant-eating dinosaur up to 125 feet (38 meters) long and weighing as much as seven elephants. Turiasaurus riodevensis, named for the region and village in Spain where it was found, lived about 145 million years ago and was a sauropod, that familiar kind of dinosaur with a long neck, long tail and massive body that walked on four stout legs. It is the largest dinosaur ever found in Europe. Previous dinosaurs of this scale have been found mostly in the Americas and Africa. 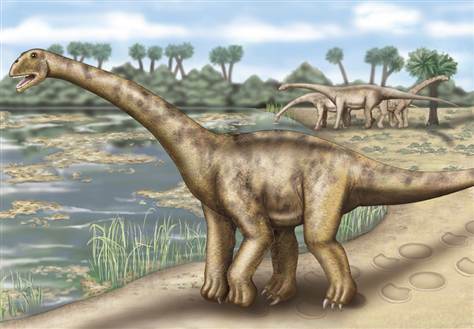 Other well-known sauropods include Apatosaurus (formerly known as Brontosaurus), Brachiosaurus and Diplodocus. This one is emblematic of a previously unrecognized branch of European sauropod evolution, the scientists said. Sauropods are the largest land animals in Earth’s history.